George Bailey (C), Dan Christian, Hamish Kingston, Cameron Boyce, Clive Rose, Ben McDermott, Tymal Mills, D'Arcy Short, Jofra Archer, Matthew Wade, Nathan Reardon, Alex Doolan, Aaron Summers. Aaron Finch (C), Dwayne Bravo, Tom Cooper, Xavier Crone, Marcus Harris, Brad Hodge, Brad Hogg, Tim Ludeman, Mohammad Nabi, Kane Richardson, Chris Tremain, Cameron White, Jack Wildermuth. 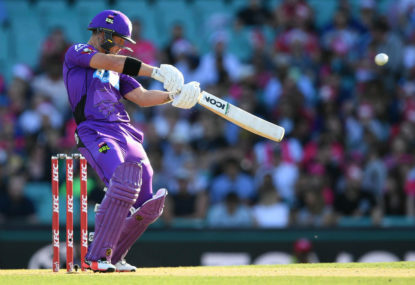 The Hobart Hurricanes and the Melbourne Renegades are set to commence their Big Bash campaigns on Thursday night at Blundstone Arena. Join The Roar for live scores and a blog of the BBL match, starting from 7:40pm AEDT. Both sides missed finals in BBL06 and will be eager to start the new season with a victory, as they push for a finals berth. Last time the two sides met it was an absolute run fest at Etihad Stadium! The Renegades posted an imposing 4/222 before the Hurricanes chased it down, largely thanks to a swashbuckling century from Ben McDermott. Another run fest is expected this time – batting is the strength of both sides and if there is a short square boundary, as often seen in the BBL at Blundstone Arena, expect plenty of boundaries. Ben McDermott is one to watch for the Hobart Hurricanes. After a blazing century in the fixture last BBL, all eyes will be on the young batter to see if he can repeat his heroics. Runs in BBL07 could see McDermott push for a berth in the Australian T20 side for the triangular series against England and New Zealand in February. Tim Ludeman is one to watch for the Melbourne Renegades. The wicketkeeper has crossed from the Adelaide Strikers and could partner captain Aaron Finch at the top of the order. After relinquishing both Matthew Wade and Peter Nevill from their squad, Ludeman has a big job to impress with both the gloves and the bat. The Melbourne Renegades to win. Whether chasing or setting a total, the Renegades line up is full of experience and power. Finch, Hodge and White bring a lot of stability to their team and will be able to control the game with the bat. Finch will be a key wicket at the top, if Finch falls cheaply than the Hurricanes will be right in the game. However, the Renegades should still be too strong because of their experience. Join The Roar for live scores and a blog of the match, from 7:40pm AEDT.